At first, Finn-Jann farm was a regular farm with cows and reindeer. First husky came in the beginning of the 80’s half by accident. No-one could see where that would lead later. 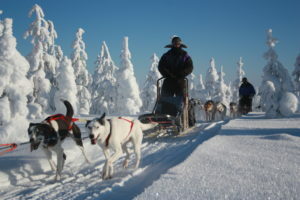 The first dog was more a pet and we used to go skiing with our ”Ressu”. Soon came some more huskies and a sledge, too.We drove about 10 years for hobby and started the first short drives with customers in the beginning of the 90’s. Common farming finished 25 years ago and started huskytours as the main trade. We were the first ones in this area and also one of the first in the whole country so it wasn’t really an easy start. Nevertheless, with great passion, enthusiasm for dogs and a new kind of lifestyle helped to push through all difficulties. Nowadays things are more stable and professional, of course. Still the same passion for dogs and will to serve the customers is still there. Our dogs still amaze us with enthusiasm and stamina that last through the long working seasons. Finn-jann huskyfarm has always been a small family company and we like to keep it like that in the future, too, with the needed amount of dogs and guides working with all their heart.